Country Blacksmith Trailers has the largest selection of flatbed car haulers and flatbed equipment trailers in Illinois! 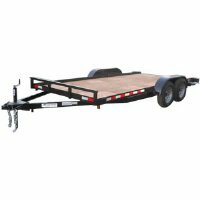 LOOKING FOR GOOSENECK FLATBEDS? CLICK THE LINK. Shop the lowest prices on PJ car haulers, Load Trail car haulers, Diamond C car haulers and all sizes of flatbed equipment trailers. Steel floors, standup ramps, slidein ramps, toolboxes, gooseneck equipment trailers are just a few of the options we have to choose from! We strive to have the best combination of price and quality that is available, and work hard checking prices and specs from multiple manufacturers to make sure you get your money's worth of trailer!